Been down south again. I played this mix for my sister as we drove around rounding up family members for a birthday party. When The Flying Burrito Brothers came on I told her the name of the band. That’s the name of a restaurant isn’t it she said? She was right, we drove by the restaurant a few minutes later. 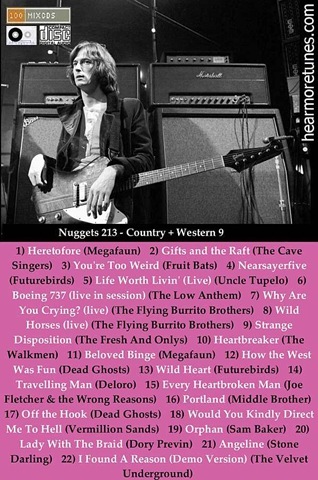 Many of these tunes are live recordings. I was impressed that Grooveshark had all the tracks I wanted in the versions I wanted, particularly the demo version of the VU track.